Problematic, as it's hard to get a decent picture of Sky, especially from the time when Francis Monkman was in the line-up, which was when they produced their second and best album. So here's my second favourites, Genesis. 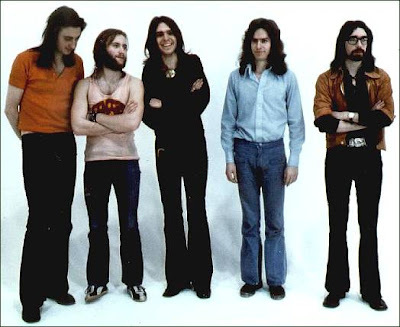 Sky (and to a lesser extent Genesis) were my gateway into decent modern music, taking me out of the commercial comfort zone of the charts and into new unexplored territory. I was familiar with Bach's 'Toccata' as it was a staple of the chapel's voluntary repertoire, and then I heard Sky's version – fast, pacy, with synths and electric guitar and a thunderous drum beat. This was pop, but a pop version of an accepted classical staple, and one of the group was a world-famous classical guitarist,so that made it okay. And while I have always instinctively shied away the hip and trendy, even when I was in my teens, these guys were ancient. I mean, they must have been at least in their thirties. (By which age, incidentally, Genesis were completely off the boil.) So that all made it even more okay. I saw Sky's Westminster Abbey performance in aid of Amnesty International on TV and was intrigued enough to buy their second album, the impenetrably named Sky2. This remains the best of their albums, for its sheer quantity of material and its variety: 'Toccata' and classical guitar duets and a six minute harpsichord solo by Francis Monkman ('Gavotte & Variations') and a piece played entirely by drummer Tristan Fry on various percussion instruments ('Tristan's Magic Garden') and the humorous little squib of 'Tuba Smarties' by Herbie Flowers and heavy, pounding electric guitars ('Fifo', 'Vivaldi') that wouldn't be out of place at a prog rock gig. Sky were also the first group I saw play live, one night at the Bristol Hippodrome. Further Sky facts: my present CEO was involved in the production of the Westminster Abbey performance, and tells me that one of the band claimed to have been the first man ever to smoke a joint in the organ box. Possibly an optimistic claim, I don't know. I also gather one of the band subsequently did jail time for getting over-creative in the accounts needed to keep his recording studio going. See, they're bad boys after all.